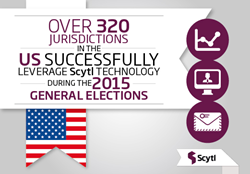 Scytl technology supports the flawless delivery of the General Elections on November 3, 2015 across 321 jurisdictions in the United States, providing election officials, citizens and UOCAVA voters quick and reliable real-time visualization of electoral results and election information. Scytl, the worldwide leader in secure online voting, election modernization and eGovernance solutions successfully delivered the 2015 General Election to over 320 jurisdictions on Tuesday, November 3, providing ballot access to UOCAVA voters before election day, voter information during election day and seamless election results publication during election night. UOCAVA Military and overseas voters from 207 jurisdictions in the states of New York, Mississippi and Kentucky benefited from more accessible voting via Scytl eBallot Delivery. Notification of ballot availability were sent during the Early Voting Period, ensuring UOCAVA military and overseas voters were able to access and return their ballots well in time for results tabulation. Scytl’s solutions have been successfully used in over 40 countries across the globe over the last 10 years, including Canada, the United States, France, Norway, Switzerland, Bosnia-Herzegovina, the UAE, India, Iceland and Australia. Scytl is headquartered in Barcelona, Spain, with strategic offices in the United States, Canada, Brazil, Peru and Greece, as well as field offices in the UK, Ukraine, Mexico, Malaysia, India, Bangladesh and Australia. For more information, visit http://www.scytl.com.